Boston, MA -- On Friday night June 25th, on a very big screen in front of Faneuil Hall Marketplace, Boston Bruins General Manager Peter Chiarelli thanked the many fans who gathered in downtown Boston as he announced the Bruins first round pick - Tyler Seguin. Hundreds of people showed up at Quincy Market to enjoy the night and fans were huddled together to watch highlights from the Bruins season, which included Marco Sturm’s overtime game-winner that ended Fenway Park’s Winter Classic. Despite the action being confined to announcements from Los Angeles there was plenty to see and do as the B’s prepared for their 2010-11 season. 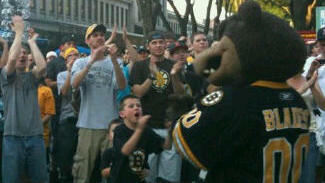 There was the usual offerings by the shops and restaurants at Boston’s favorite tourist hangout, but fans of the Black & Gold turned the outdoor meeting space into a Black & Gold clad TD Garden annex as Blades the Bruins mascot “lead” the crowd through cheers and chants, the Ice Girls threw t-shirts wrapped like burritos and prizes were offered for the winner in a Bruins texting contest. Throughout the proceedings, the main video screen showed highlights generally reserved for Garden HDX - the TD Garden’s huge center ice scoreboard -- as well as pre-draft interviews with Taylor Hall (who was selected first overall by the Oilers) and, of course, the B’s top choice, Seguin. Bostonbruins.com’s John Bishop interviewed Chiarelli before the draft and as the B’s GM outlined his hopes for the 2010 selection process, he gave his first “shout out” to the fans gathered at the draft party. That, of course, drew a huge reaction from the audience, but surely wasn’t the biggest outburst from the Bruins faithful. Then, when the new Bruins center walked on stage to accept and don his new Bruins jersey, the crowd broke into classic Bruins chants as many of them shifted the party indoors to the Hard Rock Café and wondered aloud about how quickly the pro-shop would be getting Seguin jerseys.